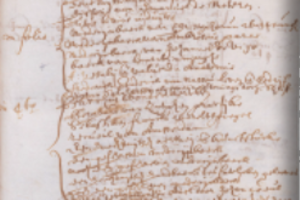 A companion to the "Gysbert’s Inventory" exhibit, the Ulster County Clerk’s Office presents this exhibit which explores the public auction of the inventory created after Gysbert Van Imbroch’s passing in 1665. Learn about the value of items to the residents of Wiltwyck. Were books worth more than clothing? Did kitchenware sell for more than livestock? Answer these questions and more while viewing "Gysbert’s Auction."